Jan and Frank Lyons with their daughters Amy and Debbie started the Lyons Ranch Angus cowherd south of Manhattan, Kansas, more than forty years ago. Jan was raised on a small Angus farm in eastern Ohio and realized that she loved being outside helping her dad with the farm and taking care of their cattle. She and Frank, whose family owned a small farm as well, wanted to raise their daughters with the ideals and work ethic they valued so much. customers asked to have “first pick”, Jan knew it was time to host a production sale. 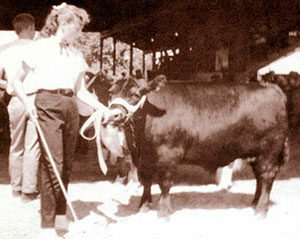 They tore down the chicken house and built a small sale barn, and held their first annual Lyons Ranch Superior Genetics Bull Sale in February 1988. The Lyons family was humbled by the acceptance by the crowd who came that day. To this day, the family feels so fortunate to know and work with some of the best cattle people in the country. On March 4th, 2019, the crew at Lyons Ranch will host their 31st Annual Lyons Ranch Superior Genetics Angus Bull Sale. 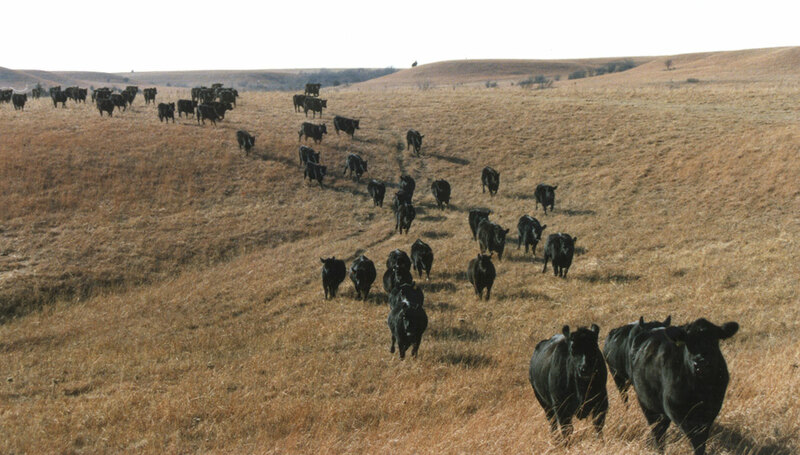 Many things have changed, but the commitment to offer the best Angus cattle possible hasn’t wavered. Lyons Ranch would truly be honored to be Your Source for Superior Genetics. 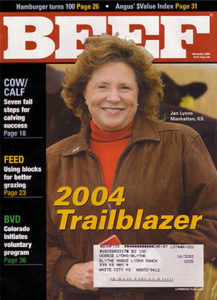 Over the years, Jan gave much of her energy and time to the beef industry and people she loved. She first volunteered as a 4-H leader at the local and county level and the Kansas Junior Angus Association. 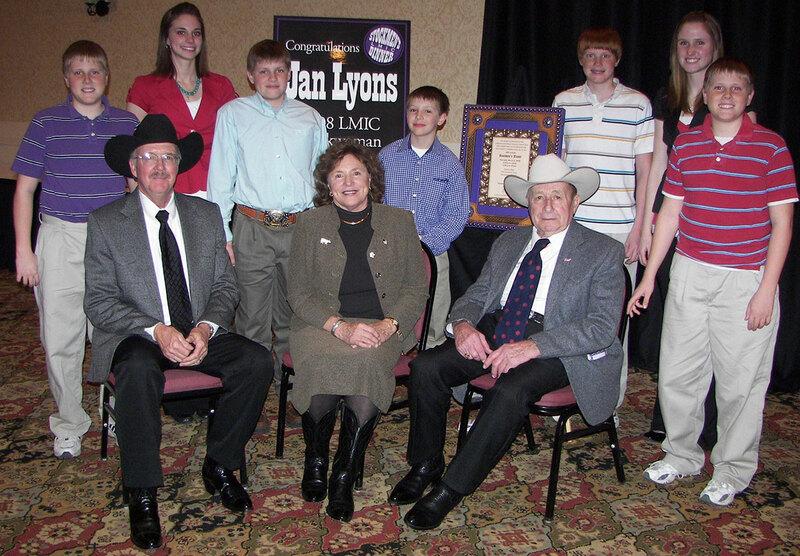 Over the years, Jan’s service included years as the first woman president of the Kansas Angus Association, chair of the Kansas Beef Council, president of the Kansas Livestock Association, chairman of the Cattlemen’s Beef Board, and, finally, NCBA president in 2004. Frank was a practicing radiologist for more than 45 years. He is now one of three physicians at Kansas Regenerative Medicine Center performing stem cell therapy for patients who are ready to get back to doing what they love — like farming and ranching — without having surgery. He has always loved medicine and, in a quiet way, has worked to help people improve their quality of life. Amy and her husband Karl Langvardt, with their sons Trey and Tanner, manage the Lyons Ranch cowherd, mostly from the south ranch located east of Alta Vista. Amy has served on the board of the Kansas Foundation for Agriculture in the Classroom and the Wabaunsee County Cattleman’s Association board and Frontier Farm Credit nominating committee. Karl has been a Wabaunsee County KLA Director and volunteer football and baseball coach. Over the years, the whole family cheered the boys on at horse shows, 4-H events, and baseball and football games. 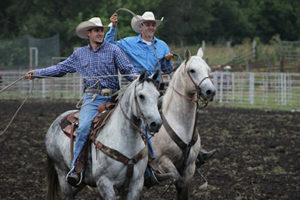 Karl and Trey like to team rope and ranch rodeo with Trent Langvardt, Karl’s nephew, who helps at Lyons Ranch. 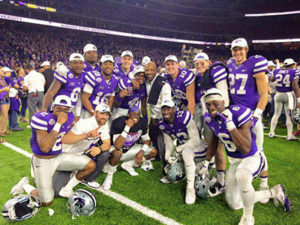 The family counts its blessings daily, and they continue to grow. Tanner and his high school sweetheart Shelby Morgan were married on June 2nd, 2018. 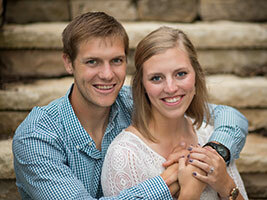 We welcome the newest Mrs. Langvardt to our crew! 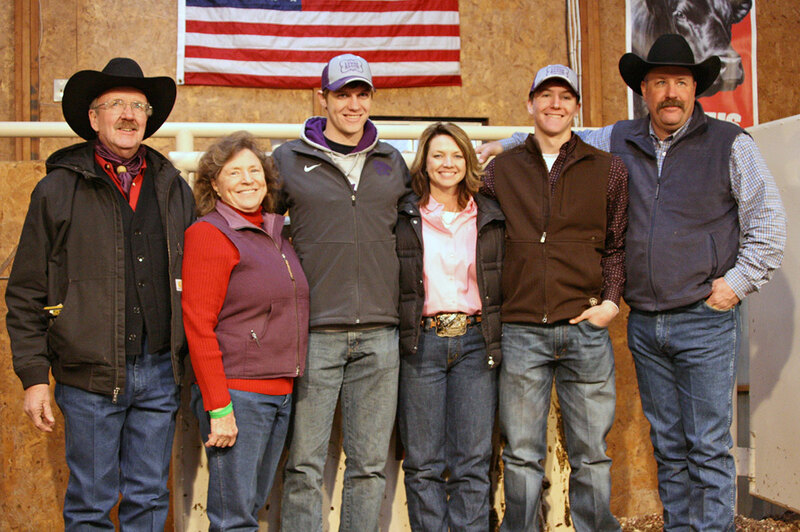 Karl ‘s family, his mother Ann and brothers Mitch and Lynn Langvardt, owns and operates two livestock sale barns — JC Livestock Sales Inc. in Junction City and Clay Center Livestock Sales in Clay Center. Over the years, Lyons Ranch customers have sold thousands of commercial cattle at the two sale barns’ regular and special calf sales. Debbie and her husband Duane Blythe and their children Meghan, Allie, Trent, Tyler and Eric, farm and ranch as Blythe Family Farms LLC south of White City, Kansas. Debbie is active in local and national beef organizations and shares her life in her blog Kids, Cows, and Grass. The Blythes have many great ventures, including Level Creek Outfitting, a guided bird hunting service started and managed by Trent Blythe. 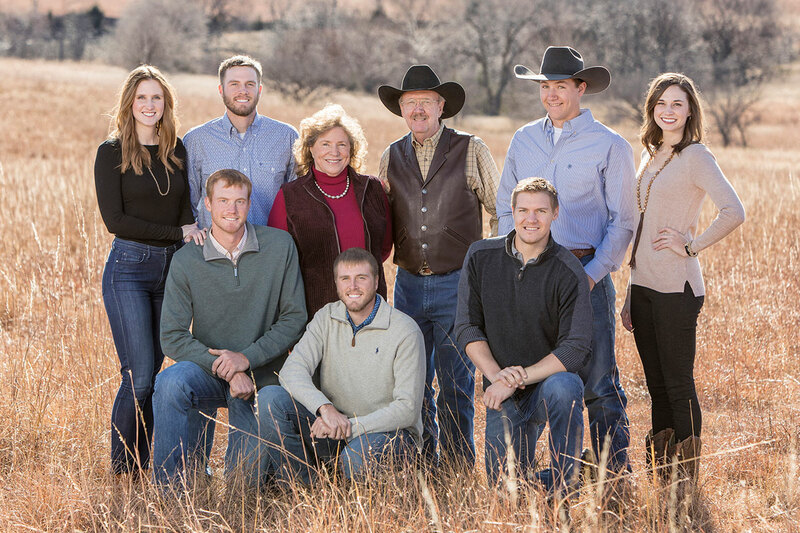 The photo below is of Jan and Frank with all seven grandchildren and her father, Harold Ferguson, when Jan was named Kansas State University Livestock and Meat Industry Council’s Stockman of the Year. Lyons Ranch has a history and a future. Our family is committed to helping you find the Superior Genetics that will carry your cowherd and the beef industry forward. We look forward to talking with you about how we can accomplish that.